A grandmother who has lived in the United States for nearly 25 years sought sanctuary in a church in North Carolina last week — the latest case of an undocumented immigrant turning to houses of worship. 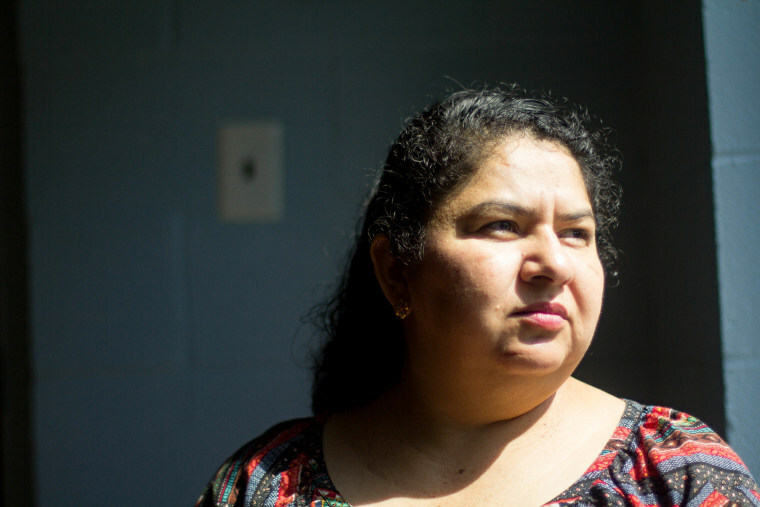 Juana Tobar Ortega, a mother of four and grandmother of two, moved into a small room in St. Barnabas Episcopal Church in Greensboro last week after she was told to leave the country by May 31. Ortega, who is from Guatemala, said she felt "desperate" when she was given an ankle monitor and told to leave the country after a check-in with Immigration and Customs Enforcement in April, her first under President Donald Trump's administration. "I couldn't stop crying. Imagine leaving behind your entire family," she told NBC News in Spanish. The Rev. Randall Keeney told NBC News that the church vestry voted "unanimously" to open its doors to Ortega. "We're talking about people's lives, entire families' lives here," he said. "I think there needs to be some degree of discretion used in this matter." Ortega said she originally came to the United States in 1993 after fleeing civil war in her home country. She tried to seek asylum legally, but her efforts failed. "I left to flee violence, and now they want to send me back to violence, and I have always tried to do my best in this country and just be with my family," she said. She said her immigration status was further complicated when she left and later re-entered the United States without permission to take care of her severely ill daughter, Lesvi, in 1999. A spokesman for ICE's Southern region told NBC News that Ortega lost her case before federal immigration courts in 1998 and then her appeal in 2001. In July 2001, she was then granted "voluntary departure," which allows an undocumented immigrant to leave the country voluntarily within a certain time frame. But the spokesman, Bryan Cox, said in a statement that Ortega "failed to leave the country and is now subject to a final order of removal." Ortega's case follows several other high-profile instances of undocumented immigrants seeking sanctuary in places of worship since the election. The Rev. Noel Anderson, grassroots coordinator for Church World Service, a nonprofit service organization, told NBC News that his group had documented six public cases since the election but had also seen an increase in people seeking sanctuary and not wanting publicity, as well as an increase in immigrants traveling to Canada for asylum. Overall, the group has documented 25 public cases in the last three years, with eight pending, including Ortega's, Anderson said. He said there were many more cases of people who were not able to get sanctuary in time. "We've seen people think about going into sanctuary and then going to their check-ins with ICE and being deported — and that is really heartbreaking," he said. ICE's policy is that "enforcement actions" should be avoided at "sensitive locations," such as houses of worship and schools, without prior approval or "exigent circumstances necessitating immediate action." Groups like the American Friends Service Committee, a Quaker advocacy organization, have taken the lead in helping families seeking sanctuary. Andrew Willis Garcés, an organizer with American Friends, said he gives training in Spanish to undocumented immigrants in North Carolina to protect them from deportation. It was there that he met Ortega's family. "We spent most of May trying to get ICE to drop the [deportation] order," he said. Eventually, the group helped Ortega secure sanctuary in St. Barnabas. Jennifer Piper, another member of AFSC, has been helping Ingrid Encalada Latorre of Peru, who sought sanctuary in a church in Denver in December. "They're giving up all of their freedom with an uncertain timeline and with no certainty of winning," Piper said. Last month, Latorre was granted a temporary stay of deportation through Aug. 7 and returned home to her family, but her future is from certain, Piper said. Keeney said he believed that the environment for undocumented immigrants had sparked a re-awakening in U.S. religious organizations since churches began illegally taking in Central Americans fleeing civil war in the 1980s. "Churches, mosques and temples should be doing this and have for a while, and I think we are waking up again because the circumstances for immigrants, particularly undocumented people, right now is so tragic and unacceptable that people are beginning to respond," he said. In February, memorandums released through Homeland Security Secretary John Kelly directed ICE enforcement officials to seek to detain or deport anyone in the country illegally, as opposed to the previous policy, during the Obama administration, which prioritized deporting people convicted of serious crimes. Ortega's oldest daughter, Lesvi Molina, 29, said the order for her mother was "very shocking," because her mother had regularly been checking in with ICE since 2011 and had not previously been a priority for deportation. "It makes me think about how many more people are out there going through this right now," she said. Cox said in his statement to NBC News: "As [DHS] Secretary Kelly has made clear, ICE will no longer exempt entire classes or categories of removable aliens from potential enforcement." "All those in violation of immigration law may be subject to immigration arrest, detention and, if found removable by final order, removal from the United States," he said. Keeney said that the issue went beyond simple legality and that current deportations policies were "extremely harmful not only to the undocumented population but to society as a whole." "Undocumented people are afraid now to even call the police if a crime was committed ... or to go to the hospital," he added. While Ortega and immigration activists hope ICE will re-evaluate her case, Keeney said the church would continue to protect her "as long as it takes." "She's part of our family now, and we're going to take care of her and protect her as best as we can, and if ICE comes, we will do the best we can nonviolently to resist that," he said. William Stock, president of the American Immigration Lawyers Association, said that while there was no "legal definition of sanctuary," ICE has long sought to avoid detaining people in sensitive areas, and the activism around such cases has sometimes been able to change the outcome of immigration cases. "The community response is often helpful in getting them to change their minds," he said. Molina said her family was "in suspense right now" and "waiting to see what happens next." In the meantime, she is grateful for the opportunities her mother gave her and said the family tries to visit Ortega every day. "I feel more pressure on me, because I know that she left the country to care for me, and it's hard to know that, maybe, if she wouldn't have gone back, she wouldn't be going through this," said Molina, who is in the country under the Obama-era Deferred Action for Childhood Arrivals policy. "And I know that also I am here thanks to her." Ortega said the support she gets now from her family is invaluable. "They're supporting me. My children come to see me, but every time they leave in tears," she said, her voice breaking. "It's very difficult."